A stunning Palladian dormer window smartens the exterior of this economical home, while inside it expands and adds drama to the vaulted foyer. This one and a half story home features a relaxing front porch, a generous great room with fireplace, a practical U-shaped kitchen, formal and informal eating areas with bay windows, and a convenient first floor master suite. Like the master suite, both upstairs bedrooms include walk-in closets. Dormer alcoves add interest and illumination to the second floor family bedrooms, and an oversized bonus room offers an abundance of space for storage or future expansion. 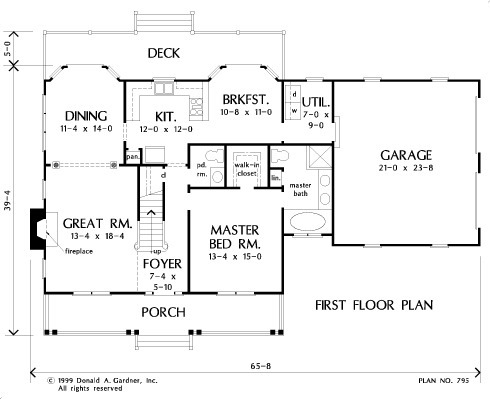 1st Floor: 1309 Sq. 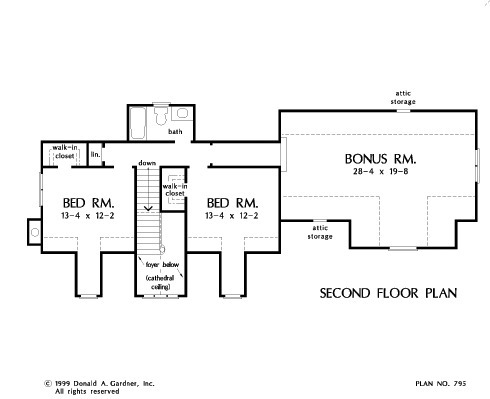 Ft.
2nd Floor: 582 Sq. Ft. Bonus Room: 570 Sq. 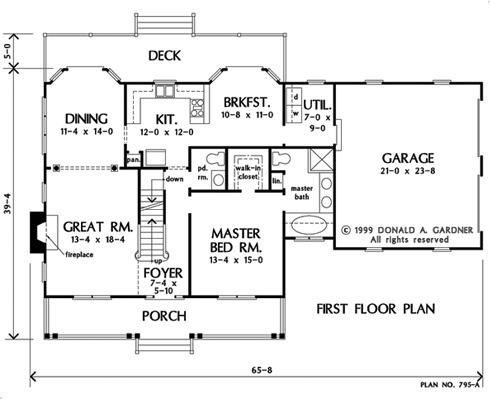 Ft.
House Dimensions: 65' 8" x 39' 4"
Great Room: 13' 4" x 18' 4"
Foyer (Cathedral): 7' 4" x 5' 10" x 21' 2"
Dining Room : 11' 4" x 14' 0" x 9' 0"
Great Room : 13' 4" x 18' 4" x 9' 0"
Kitchen : 12' 0" x 12' 0" x 9' 0"
Breakfast Room : 10' 8" x 11' 0" x 9' 0"
Utility Room : 7' 0" x 9' 0" x 9' 0"
Bonus Room : 28' 4" x 19' 8" x 0' 0"
Garage : 21' 0" x 23' 8" x 0' 0"
Master Bedroom : 13' 4" x 15' 0" x 9' 0"
Bedroom #2 : 13' 4" x 12' 2" x 8' 0"
Bedroom #3 : 13' 4" x 12' 2" x 8' 0"
Porch - Front : 35' 0" x 6' 0" x 0' 0"
Deck / Patio : 35' 0" x 7' 0" x 0' 0"